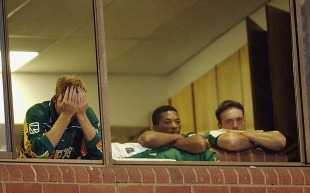 Perhaps the most remarkable of all of South Africa's crumbles in major matches. South Africa had won the inaugural version of the Champions Trophy in 1998 - their only ICC title success to date - and were coasting towards a place in the final of the 2002 edition. Having limited India to 261 for 9 in Colombo, South Africa were cruising at 192 for 1 in the 37th over, the result seemed a foregone conclusion. The easy task ahead may have prompted Gibbs to retire hurt after suffering from cramps, convinced as he may have been that the others would take his team home. But they were to let him down, and with 21 required off the final over, Sehwag survived a first-ball slog-swept six from Kallis to grab two wickets and leave the South Africans with that familiar feeling. They have not won any knock out games in the world cup. Ever since they came to Bangladesh. All South African players have stopped using twitter. ???? even andy zaltzmann wrote that net connection is very erratic in dhaka 'like test 100's in agarkar's career'. he had only 2-3 tweets yesterday. Shocking! I'm heart broken... I was really pulling for these SA guys... damn it!! according to me they r the most balanced side,all 3 dprtmnts are of high level. ^ balance diya ki ar hobe. If they can't chase down 174 or 214 after a great start than they don't deserve to move into the semifinal or final.